Recent studies at and Nutrition Research in Australia (C-PAN) gives me a clue as to why I have such a difficult time keeping our home tidy. Researchers found that dusting, vacuuming and scrubbing the bath generate physical health benefits yet the monotony of the menial work brings no mental health rewards. Now I know why I find it so difficult to do housework – it’s monotonous! Of course it’s monotonous! Oh, I’ve known a few people who actually enjoy housework, but I’ve just assumed they are mentally unstable…perhaps even more unstable than me. Running, swimming and gym workouts all help people stay fit and mentally healthy and people who undertake these types of exercise are less likely to suffer depression. But housework does not engender the same mental health benefits and shows no protective effects against symptoms of depression. To come to their conclusions, the University conducted two studies. The first study, funded by the National Heart Foundation of Australia, surveyed 1554 women aged 18-65 from 45 Melbourne suburbs and all walks of life. The second, funded by the National Health and Medical Research Council, surveyed 3645 women living in 80 socioeconomically disadvantaged Victorian neighborhoods in urban and rural areas. Being a member of a sporting or recreational club, having someone to walk with in the neighborhood and being active with a family member are all associated with improved mental health. This is all very exciting news to me. I can now comfortably blame my bipolar disorder for not being able to keep the house looking shiny and new. You know, many people accuse those of us diagnosed with bipolar as using our disorder as an excuse to avoid responsibility. I believe I’ll keep a copy of this report on hand so I can rub it in the noses of those who claim we’re just plain lazy. Finally, Professor Ball has to end on a low note by saying while housework may not confer mental health benefits, it does provide physical health benefits and is a useful form of exercise for many people. ‘So spring cleaning’ is still good for health,” she said. LOL. Good point. Actually, what I’d really like is a magic pill that will make me want to clean house. I sit in the middle. While I agree housework is monotonous, I would say the physical activity can be as beneficial as a good work out. However, like a good work out, many of us just can’t be bothered. Personally I hate cleaning so try to keep things clean as I go. The downside is whenever the place starts to look untidy and dirty, it starts to mess with my mind and does get me down. 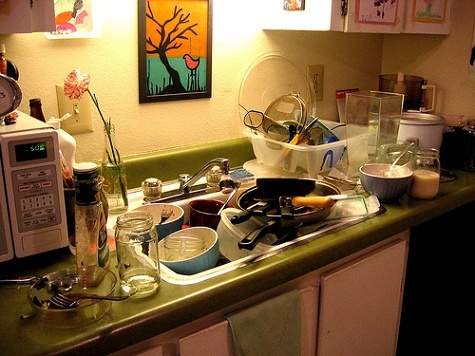 My home resembles my mind; tidy and clean on the outside, but don’t look inside the cupboards! Yer, I once got into a terrible rut at home. It was torture trying to get on top of it again, I tend not to let it get messy. It’s 81 degrees in our non-air conditioned house. Moving around – meh. Strike one. Just last week we began limiting our daughter to 1/2 an hour a day of screen time. Far less screen time means far more play time, with lots, and lots, and lots of toys. Strike two. Forgot to give said daughter ADHD medication this morning so everything she touches is chaotic today. Strike three. The big dog is shedding like, well, like a big dog. Did I mentioned it’s 81 degrees? Strike four. Can you have a strike four? I don’t like housework when all my ducks are in a row. I have to say today I loath it. And like journeyupword visual clutter puts my teeth on edge. I think my best strategy is to have some ice cream read some of my favorite blogs and worry about it tomorrow. It will still be here waiting for me. I’m with ya, totally hate housework — and now have a reason! I know I would be less stressed out if here wasn’t laundry everywhere and the kitchen were clean, just can’t seem to get there. You had me laughing. After becoming aware of my potential triggers, I discovered that I have a need for a fairly structured life and visual order. To have to see house in disarray for a day or more can make me feel edgy and get some anxiety going. It’s the anxiety that can lead to mood swings. So, although I don’t like housework it is necessary for my mental wellbeing. As far as my physical well being, housework hasn’t touched me there yet that I can see. Laughter is great way to start the day isn’t it? (assuming it’s the start of the day wherever you are.). I know from experience how much more successful I am when I have structure, it’s just so hard to get back to once you stop.